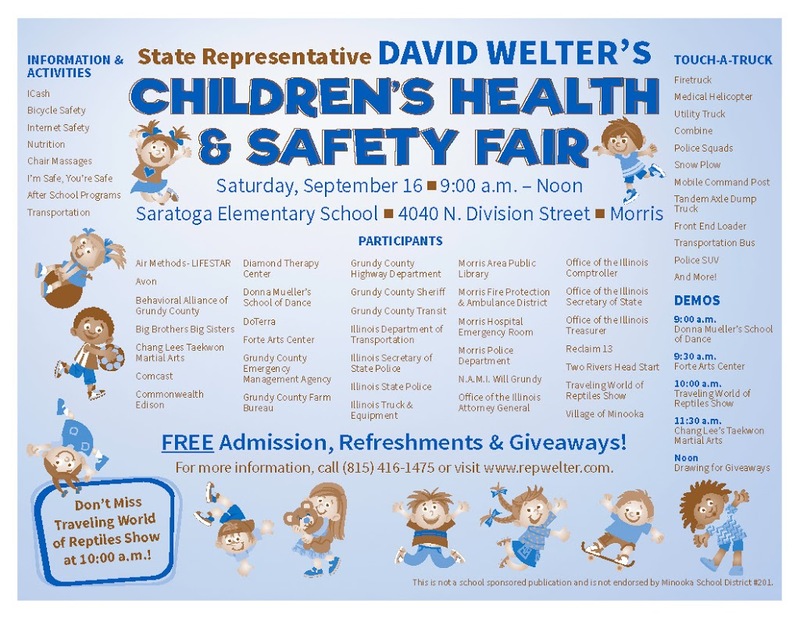 MORRIS– State Representative David A. Welter (R-Morris) invites local families to attend a free Children’s Health & Safety Fair at from 9:00am – Noon on Saturday, September 16 at Saratoga Elementary School, located at 4040 N. Division Street. 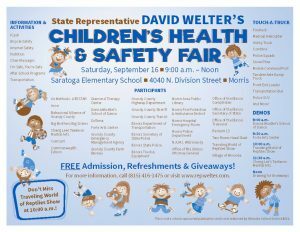 The event features over 30 state and local agencies, non-profit organizations and businesses covering a wide range of educational, health and child care, recreational and community services for families and children. Special attractions include the Traveling World of Reptiles Show and the popular Touch-A-Truck exhibit featuring over 15 trucks and a medical helicopter located in the parking lot. Admission to the event is FREE with complimentary refreshments and a drawing for giveaways. Information will be available on topics such as bicycle safety, after-school programs, nutrition, internet safety, the Illinois State Treasurer’s I-Cash program and more. Demonstrations at the event include Donna Mueller’s School of Dance at 9:00 a.m., Forte Arts Center demonstration at 9:30 a.m., the Traveling World of Reptiles Show at 10:00 a.m. and Chang Lee’s Taekwon Martial Arts at 11:30 a.m. A drawing for giveaways will take place at Noon.